It is amazing how familiar smells can send us back to our childhood in the blink of an eye-a warm spring rain, sweet watermelon, freshly mown grass, good food smells coming from the kitchen….these can all be comforting to us through our senses, but when the mere SIGHT of a WORD brings that smell from your memory and you go, EWWWWW, well that has to be one strong memory! Mine comes from the word PAW PAW! Nope, not your GrandPa, or your Gramps, or you GrandDaddy….that overly ripe fruit that falls from the tree. apple picking where somebody, somewhere was sure to be stung before we headed home from the day’s adventures. My flashback moment comes from our adventures in the ‘Paw Paw Patch’! Oh yes the Paw Paw Patch! The memories are so vivid …. The truck that was filled with children and boxes and bags of Paw Paws. The ride to the Paw Paw Patch seemed to take too long. We were excited to go play in the creek. The trip home definitely took even longer because I had to sit beside those boxes and bags of Paw Paws. Can you feel my pain? That smell blowing all around me, all the while, trying to hold my breath as long as I could without anyone knowing why. I tasted one, only once….that was enough for me. It quickly became one of the very few things that I just can’t bring myself to taste again. Over the years, I have scouted out trees and suffered the smells just to get a few for my Mom to enjoy. I tried to convince myself that it was just an overripe banana so I could share one with her….sorry, just couldn’t do it. Recently, I have found myself gathering them for my middle child (brought him some last season and put them in his freezer) where he has used them to make such dishes as PAWPAW Sorbet!!!!! Imagine that! Maybe, one day, I will be able to take one and peel it and eat it like a peach and get that look of enjoyment that I saw on my Mom’s face….maybe not! Jawyce M….. You do realize there are a few of us…. mighty few who are actually allergic to those bad boys. I LOVE PAW PAWS!!!! They HATE ME!!! Just like shrimp…. Belinda, love Paw Paws. Yes, in my Appalachian News Express article I did have a “Paw Paw” advisory regarding allergies. I hate it for you….Paw Paws are so much fun to cook with! 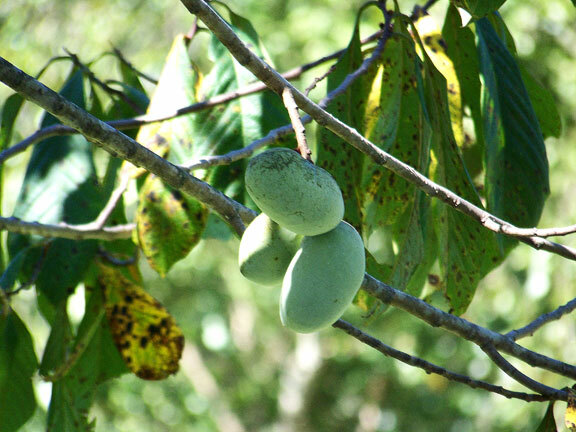 I love pawpaws. I make fritters and bread with them. Our pet possum, Pemon, loves them too. There is a pawpaw tree growing in Istanbul, Turkey from a seed I swapped over the internet. I like that idea. Can’t for the life of me remember what I swapped for. I should write these things down.